From traditional to modern, fireplaces that fit in a corner come in a range of styles and colors to match the decor of your home, including wood, brick, and metal. The space-saving nature of corner gas fireplaces and electric corner fireplaces make them a viable option for any living space, be it an apartment or large home. Many come with a large mantle top for displaying family photos or supporting a flat-screen television while others are designed to fit in a peninsula. Whether you prefer wood-burning or gas, if there is an unused corner in your home, there is a corner fireplace for you. 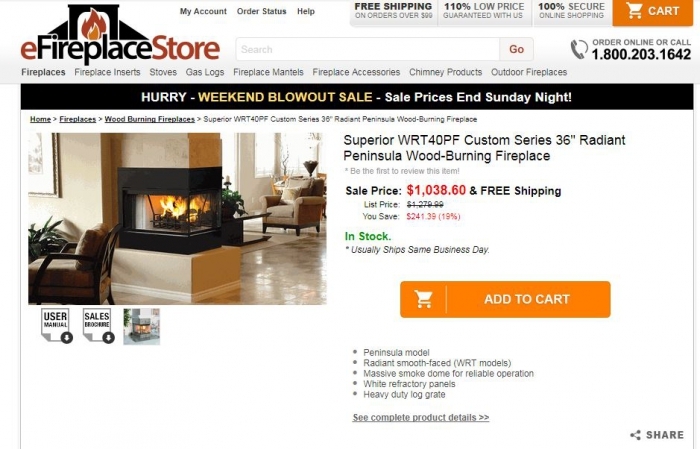 You used to have the "Superior WRT40PF Custom Series 36" Radiant Peninsula Wood-Burning Fireplace" What happened to it? We still offer this model, and it is in stock for immediate shipment--please see it here: Superior WRT40PF Custom Series 36" Radiant Peninsula Wood-Burning Fireplace. In cases where the floor space of a room is just too limited to justify installing a fireplace and mantel on a flat wall, corner fireplaces can be an excellent alternative. Whether it be for an inside or outside, we have many options that will allow you to enjoy the ambiance provided by both corner gas fireplaces and corner electric fireplaces, without having to worry about arranging your furniture in a compromising manner. Having difficulty choosing between gas or electric? The helpful technicians at eFireplaceStore.com are just a call or click away and will be happy to guide you in making your selection.